I was last in Philadelphia two years ago when I visited a bunch of places, took photos and wrote them up, but, for a variety of reasons, failed to publish them. This week, therefore, is going to be Philadelphia week, which kicked off yesterday with the original Plenty Café, on Passyunk Avenue, and continues today with Peddler Coffee, another in a long line of Philadelphia coffee shop/roasters. When I first visited Peddler, following a tip-off from my friend Greg, it had been going for just under a year, serving a range of single-origin coffees on espresso and on pour-over, exclusively through the Chemex. Fast-forward two years and Peddler will be celebrating its third birthday next week. It’s still going strong, still roasting great single-origin coffee and still essentially doing the same things, with a few tweaks here and there for good measure. As well as coffee, there’s tea, and, if you’re hungry, a range of cakes and pastries. In a city full of physically beautiful coffee shops, Peddler is up there with the best of them. Indeed, I had forgotten how beautiful it is. Kitted out in dark wood and exposed brick, it’s a glorious place to drink your coffee. Like Ultimo Coffee and Plenty Café, Peddler Coffee is one of those places that that looks small from the outside but is much bigger than it seems. On the corner of North 21st and Spring Streets, it’s across the road from the Franklin Institute and a couple of blocks from the Barnes Institute, a world class art gallery. From the street, it looks like it’s a small, square coffee shop, with the door on the corner, at 45⁰. However, stepping inside, you find that Peddler extends a long way back, occupying the entire building along 21st Street, ending up maybe three times deeper than it is wide. Nevertheless, the bulk of the seating is in the square part at the front, where all the natural light is, which makes sense. The door is flanked by a window-bar on either side, each with a pair of stools. Taking the front to be the short side facing Spring Street, the majority of the seating lines the right-hand wall, starting with a high, two-person table, followed by four low, two-person tables. When I first visited, a pair of tables between door and counter made access a little difficult. However, one of these has since been removed, and the other, a four-person table, turned around by 90⁰, which has opened Peddler up no end. The counter is in the back two-thirds of Peddler on the left-hand side, with a two-group La Marzocco Strada espresso machine facing the front. The main part of the counter faces the right-hand wall, with a generous space for the three Chemex (Chemexes?) and the till, while at the far end is a cabinet with cakes and pastries. The wall behind the counter is taken up with grinders (espresso, decaf and filter), a hot water boiler and cold-brew kit. There’s more seating back here, with a narrow five-seater bar against the right-hand wall, opposite the front part of the counter. Peddler Coffee only roasts single-origins, with four or five on offer at any one time, the specific coffees on offer change on seasonal basis, roughly every 2-3 months. One of these is always a decaf, with another (the top one on the menu) available as espresso. Meanwhile, all of them can be had as a pour-over through the Chemex. Before 11am, Peddler offers a neat alternative to batch-brew. Instead of using an automated brewer, a large Chemex is prepared and then kept warm in a standard batch-brew flask. It’s batch-brew by stealth! When I first visited in 2016, I had the excellent Finca San Jose from Costa Rica as a Chemex. This had a surprising amount of body (for a Chemex) and was well-balanced, with a strong flavour, and got even better as it cooled in the mug. On my return, I was sorely tempted to have another Chemex, but instead I went for an espresso, rewarded with the gorgeous Brazilian Prima Materia. This smelled fantastic and was served in a glass with a glass of sparkling water on the side. To drink, it was no less impressive, turning out to be beautifully well-balanced with a rich, complex taste. A very impressive coffee indeed. 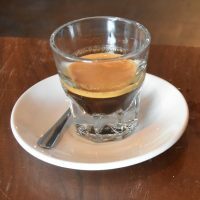 I paired this with an heirloom whole-wheat English muffin, toasted of course, to soak up all the caffeine (the espresso was my fifth coffee that day!). This entry was posted in Cafe/Roaster, Cake, Coffee Shops, Laptop Friendly, Philadelphia, Retailers and tagged include by Brian Williams. Bookmark the permalink.